Carmelo Anthony played one season at Syracuse University, during the 2002–2003 season, where he averaged 22.2 points and 10.0 rebounds. He helped guide the Orangemen to their first ever NCAA tournament title in 2003. Anthony's 33-point outburst against the University of Texas in the Final Four set an NCAA tournament record for most points by a freshman. In the championship game against the University of Kansas, Anthony had 20 points and 10 rebounds. For his efforts during the NCAA tournament, Anthony earned the tournament's Most Outstanding Player Award. Some of Anthony's highlights in his time with Syracuse include being named Second-Team All-American by the Associated Press as a freshman, leading his team to a 30–5 record, capturing the school's first ever NCAA title and being the consensus pick for NCAA Freshman of the Year. 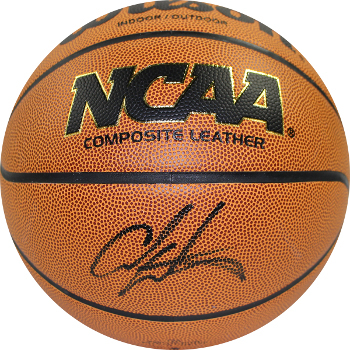 Carmelo Anthony has hand signed this indoor/outdoor NCAA Wilson basketball. A Steiner Sports Hologram and Certificate of Authenticity is included.